Use this search tool (powered by Google) to check our site for the astronomy information you need. The search will only look at the Rader network of science and math sites. Thanks for visiting! Right now you're on COSMOS4KIDS.COM. If you are looking for astronomy basics and the science of the stars, stay on this site. You can start by choosing one of the sections above or if you're not sure what to click, try our site map. That will show you all of the space science topics we cover. If you surf the site and get lost in all of the information, use the search function on the side of the pages. So you're asking, what is ASTRONOMY? Well... Here's our best definition. Astronomy is the study of the Universe and the changes that take place in and around all objects moving through space. It's more than just Earth and our Solar System. The study of astronomy covers every planet, object, and bit of energy flowing through the universe. So where did the word cosmos come from? It's actually a Greek word that describes an orderly and interconnected universe. Astronomy is the study of that universe and as you learn more, you will discover how each part is connected to the others. But where do you start? There are moons, planets, stars, systems, and galaxies. We'll start with the big picture and a general overview of the universe. Go take a look! That's it for the introduction. Now its up to you to click and have fun! 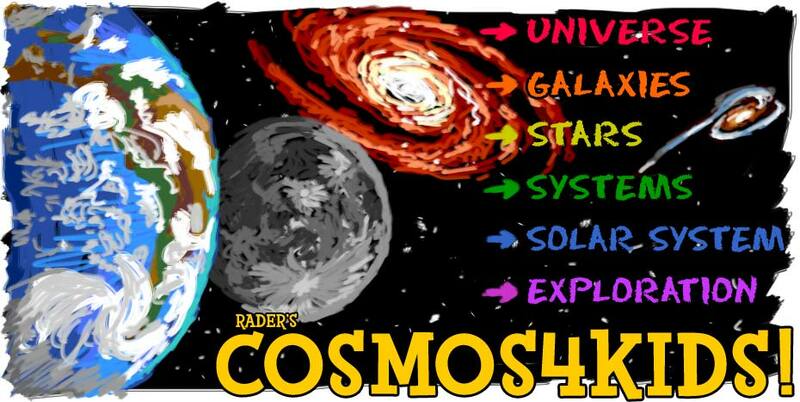 COSMOS4KIDS is one of many free science sites developed by our team. You may have also used Chem4Kids, Biology4Kids, Geography4Kids, or Physics4Kids. We also have a math site called NumberNut.com. Now it's time for you to dive into our astronomy pages and start learning. Remember, the site offers an introduction to the science of space. If you're not into graphics like home page image above, check out the search tool (powered by Google) that will check our site for the astronomy information you need. Just type in a keyword or phrase and click the search button. The COSMOS4KIDS results will be highlighted on the results page. ** Andrew Rader Studios does not monitor or review the content available at these web sites. They are paid advertisements and neither partners nor recommeded web sites.